Tired of doing repetitive tasks on some emails you receive? AppEngine Mail Processor is here to solve your problems! Sometimes we receive emails that ask us to click on a link to confirm an account, or to send some data or any other task. Everything that is triggered by an email and that requires an automatic task to process it can be programmed using this application. If the automatic task runs fine you will not have to do it yourself, if the task doesn’t work because something has changed you can always do it manually and fix it for the next time. You will not lose the time to repeat the same task again and you will get a report with the results. AppEngine Mail Processor is an application designed for Google’s AppEngine application server. This application will receive the emails you choose and execute the actions or tasks you want over them. It is possible to add new actions to do anything you need to do. The application will then send the result of the action back in a mail, you just need to check the result mail and forget it. AppEngine Mail Processor is open source so you can download it and use it in your applications. You can configure your own tasks or extend the application functionality. If you do, tell us about it! Create your account and basic application in Google’s AppEngine (http://appengine.google.com/, http://code.google.com/appengine/). We used AppEngine for Java version 1.4.0, so use a compatible version. Download AppEngine Mail Processor code from GitHub: https://github.com/lamboratory/AppEngine-Mail-Processor and add it to your application code. Modify web.xml file to process mails by the com.lamboratory.mail.Mail class. Configure the application to reveive emails in appengine-web.xml. Implement Action interface if you want to use a new action. Upload your application to AppEngine. Change the mail address in Mail.java class to a valid administrator of you AppEngine application. This is required to send emails from AppEngine. Create a filter in your mail to forward emails based on subject or sender to the desired AppEngine, depending on the Action to execute. To execute example ClickLinksAction you can use click_links@<yourAppEngineApplicationId>.appspotmail.com (Note it’s different from <yourAppEngineApplicationId>.appspot.com). If you want to check the logs for your application you’ll need to raise log level to info using logging.properties file. Forget about repeating the same task again! “Twitt… Quién?” es una extensión para Google Chrome que busca usuarios de twitter en las páginas visitadas y muestra información sobre ellos: “Twitt… Quién?” se puede descargar aquí. Hemos desarrollado la extensión @jorgelamb y @guillelamb (<– al lado de nuestros nombres deberíais ver un iconito si estáis leyendo esto en el lamboratory con la extensión instalada), una vez más con la importante colaboración de nuestro primo Pablo (<– aquí también deberíais ver un iconito;-) en las imágenes y el css para ponerlo todo presentable. En esta ocasión, tenemos que agradecer a otro “Pablo”, @PaulKinlan (<– iconito! ;-), el aconsejarnos sobre cómo recorrer el DOM para encontrar un patrón, ya que tuvimos la suerte de charlar con él un poco durante el pasado DevFest en Madrid. Técnicamente, hemos usado unas cuantas de las APIs de extensiones de Chrome, desde la de OAuth para el login en twitter hasta la de internacionalización (ya que la extensión está tanto en castellano como en inglés). Somos conscientes de que la extensión no siempre encontrará los nombres o mostrará la información correctamente (por ejemplo, cuando la página carga cosas con AJAX, o use frames, etc. ), y seguro que habrá más bugs (aunque esperamos que aún así resulte útil:-), así que adelante con vuestro feedback! We are increasingly dealing with Linked Data, witnessing how Internet is turning into a Web of Data, a huge DataBase with very different sets of data linked together and available online. We thought we could use this information not only to find answers, but also to automatically generate questions… for a quiz that could be played. In order to submit the app to the contest (and also to fit everything in 10K), we had to focus. And yes, there would be many interesting questions to be generated thanks to information made available from open governments… but we thought that asking questions about cinema would be a much better option for a light quiz. Plus, we had the chance of using the Linked Movie DataBase, which has information about tens of thousands of movies and actors… Plenty of cinema questions could be generated with that! 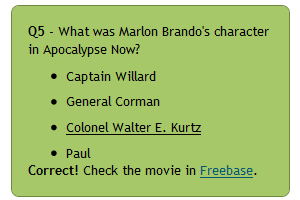 We decided to let the user choose an actor or actress, and generate a quiz with questions about the movies where he or she has appeared. 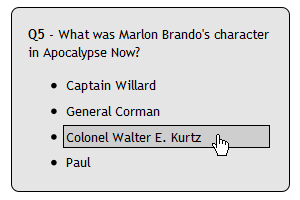 What kind of questions are generated? Some of them are pretty straightforward to create: For example, the director and release date of a particular film are easily related to the actor (See image on the right). Then it’s only a matter of giving other dates as options, or other directors of movies where the actor or actress has acted. For other questions, there are more relations involved. 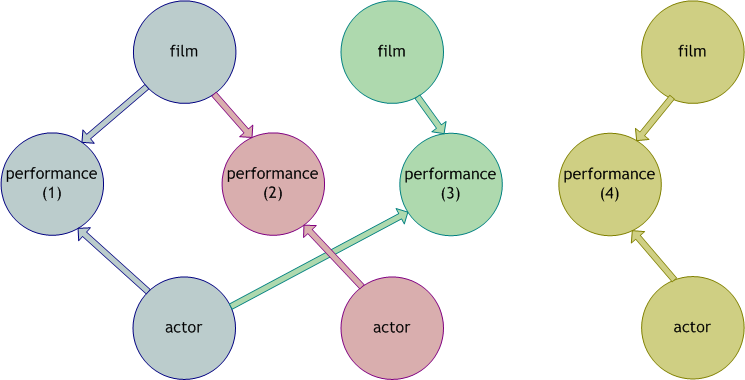 For instance, the application asks which character did the actor or actress play in a particular movie (“performance 1” in the following image), giving as other options another character in the same movie, played by another actor (“performance 2”), another character played by the same person but in another movie (“performance 3”), and another character played by a different person in a different movie (“performance 4”). The LMDB exposes the data through a SPARQL endpoint, which was very convenient for our purposes. With just a few queries, the application is able to retrieve the information needed to generate a quite decent set of questions. 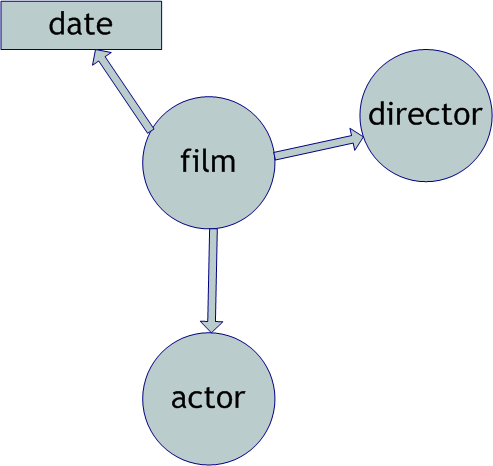 The following lines illustrate a query used to retrieve information about all the movies an actor or actress has appeared in (the title, the name of the character played, the name of the director, and the links to the IMDB and Freebase websites, if available). Importantly enough, the 10K contest implied other limitations in addition to the code size: As client-side code is being used, it was kind of tricky to grab the information directly from the browser. Luckily, using jQuery in combination with YQL we could sort out this issue, also benefiting from its caching advantages, as we are particularly worried about knocking the LMDB down. We would like to thank Oktie Hassanzadeh and the LMDB team for being supportive. Plus, in extension, thanks to the whole Linked (Open) Data crowd. Additionally, we are grateful to the YDN and its YQL. In particular, Christian Heilmann (@codepo8) has lately been an inspiration in terms of how to easily build a webapp with external content. Finally, María Rodri and María Ipa, and our colleagues at iSOCO and Buongiorno are to thank for their valuable feedback and support. iWeekend has meant a lot for us during this 2009, as we had the chance to attend three of them, and each of those in a different manner. It all began of course in January with the creation of Tusiyu; we had such a good experience there that we decided it was an experience worth repeating, so we attended the next one at Valencia in June, where Rifalia was born. In November, 10 iWeekends were run in parallel, and we helped organize the one at Madrid, in the one where Emprendemas was created. All in all, we could live the iWeekend experience in three different ways (with our idea selected, contributing for a different one, and also from the organization point of view) and we feel lucky for those, and of course, for the people we have met. We have not forgotten other code events; for example we were able to attend a Yahoo! Developer Network evening in Barcelona and then another one in Madrid. Regarding older projects, with so many things going on, we didn’t have much time to keep being involved in the developments such as for Google Gadgets, as we had previously been. Let’s see how things keep going during 2010. 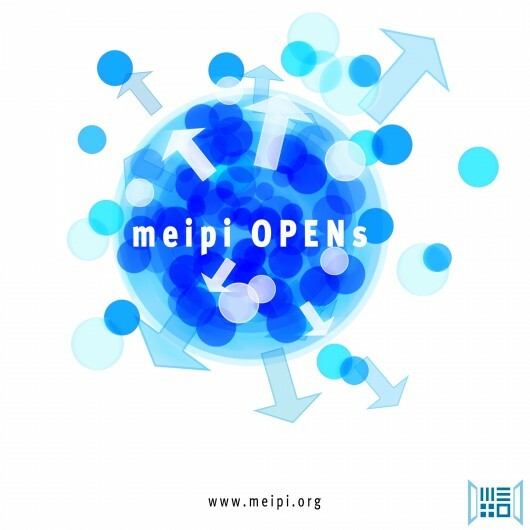 (Yes, we know we’re already in March and still covering last year;-) Even though we’re trying to focus (at least a bit;-), we’re always open for new ideas and experiments, so who knows! The truth is that later on we didn’t pay all the attention we would have liked to this project, due to the ongoing ones in parallel, despite of having some (interesting, we think;-) ideas on how the experiment should evolve, trying to promote the ratings via games with a purpose or crowdsourcing them via Mechanical Turk or similar. The good news is that we might have found (or they might have found us! ;-) the right partners to make this experiment evolve and be more useful. Stay tuned for news in this respect, which should come up in the first half of the year. The project has a blog, even though we don’t update it so often. Check out the “tubegraphs of the month“, and analysis such as this basketball one over the generated graphs (example below) that show which are the most interesting parts of each video. The story of Tusiyu began last January, when we attended the first edition of iWeekend in Madrid (a sort of “Startup Weekend” where 50 people choose an idea and develop it together) and we were lucky enough to get ours selected: A simple agreement tool for a group of friends to choose when and where, which ended up being Tusiyu. After the productive weekend and some time to refine the most important bugs, the tool was fully usable, and indeed used for different purposes (not only to organize dinners, but also trips, etc.) 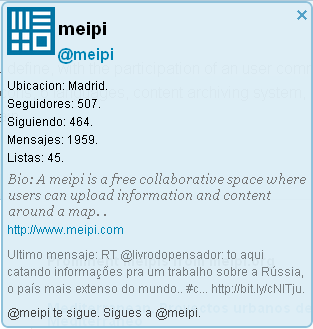 and little by little, thanks to the feedback of people, by an increased number of users. In order to be able to keep growing and adding features (some of them are already taking place, like comments, edition or subscription), linking the tool with other systems (like table-reservation ones), etc., Alex joined the team in November. We have just reworked the design, and look forward to keep improving the project! En general, la gente que esté leyendo este post sabrá lo que es un feed, y la utilidad que tiene para estar al tanto de todo tipo de actualizaciones en Internet. A nuestro padre por ejemplo le tenemos ya convencido de las bondades del rss. Nosotros es cierto que no actualizamos este blog tanto como nos gustaría, pero nuestro feed avisa en las raras ocasiones en que sí publicamos. We’re also taking this opportunity to show some lamb pictures (or rather, lamb-tagged photos from flickr😉 right here, using some minor modifications from his Barcelona YQL example. Después de lo bien que lo pasamos en el iWeekend de Madrid, en el que salió adelante nuestra idea de Tusiyu, teníamos muchas ganas de repetir y participar desde otro punto de vista. Así que no lo dudamos y el fin de semana pasado nos plantamos en Valencia para ayudar en la creación de una nueva startup. En este iWeekend salió Rifalia, una idea promovida por Juan Ramón Vidal que “tiene todas las papeletas” (lo siento, tenía que hacer la broma; seguro que a alguien más se le ha ocurrido;-) para ser un éxito. Esperamos poder comprar unos boletos pronto para ganar alguna de las casas que Juanra y compañía están ya preparando para rifar. Como ya hemos comentado en el blog de Tusiyu, confirmamos que la experiencia es estupenda, y estamos encantados de haber visto a viejos conocidos y haber aprendido de nuevos.